Just when you thought that Brad Pitt and Angelina Jolie would forever remain the perfect poster couple for building a life together without a legal certificate to tell people you're in love, they shocked the whole world with something that really wasn't a surprise at all. After years of saying it wouldn't happen, Jolie and Pitt finally got married in a secret ceremony attended by their family and friends. And when I say secret, I mean secret. 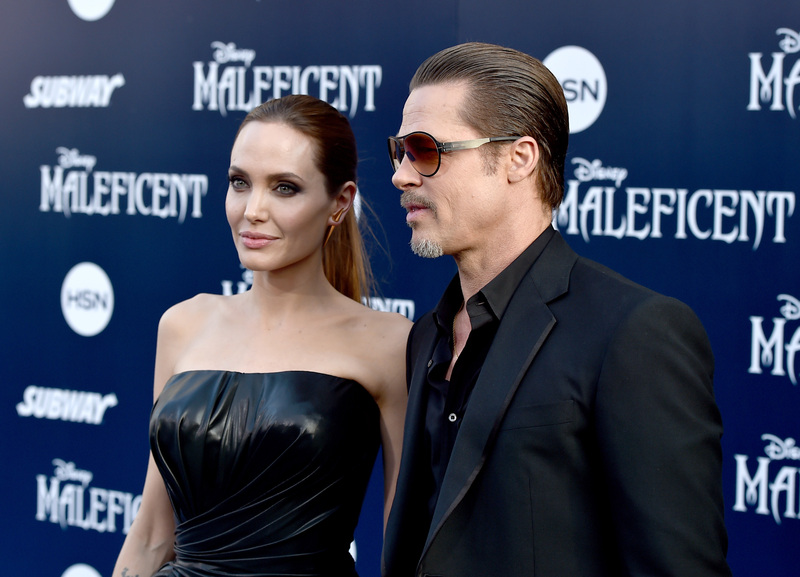 Jolie and Pitt got married on a Saturday and no one knew until their representative announced it the following Thursday. While we speculated what their wedding ceremony and honeymoon looked like, most of the visual details remained a secret. Now People magazine has released the first photo from Pitt and Jolie's wedding along with the revelation that the whole thing was basically planned by their children. The Jolie-Pitt family has six children, Maddox, Pax, Zahara, Vivienne, Shiloh, and Knox, and we had already been informed that each child had a key role to play in the ceremony. Maddox and Pax walked Jolie down the aisle, Zahara and Vivienne were the flower girls, and Shiloh and Knox were the ring bearers. However, it appears that their responsibilities also extended to helping to write the wedding vows and even baking the wedding cake. Even more importantly, Jolie's wedding dress incorporated her children's drawings into the very design. So, basically, the Jolie-Pitt children, whose ages range from 6 to 13, planned the biggest secret wedding of the year. We haven't seen more pictures from the ceremony yet, but if this is what they can do before any of them can even drive, then I foresee a bright future in event planning for all of them. Even better, imagine if the Jolie-Pitt children were hired to plan some of the other big celebrity weddings, past and future. All right, so the oldest of the bunch, Maddox, was only about 6 when Beyoncé and Jay Z got married, but, hey, being 6 didn't stop Vivienne and Knox from helping to plan a great wedding for their parents. The home movies that Bey and Jay showed during their On the Run Tour showed an even smaller and more intimate ceremony than Jolie and Pitt enjoyed, which would have made it even easier for the Jolie-Pitt children to decorate. And the vows, with their help, would have been adorable, OK? Kardashian and West went for flashy and expensive over small and subtle, so admittedly the Jolie-Pitts might have been a bit out of their league planning this wedding. However, if there's one thing that they definitely could have fixed from this ceremony, it would be finding a bigger role in the wedding for North West. After all, North looked like she wanted to be taking a nap instead of watching her parents walk down the aisle. Someone get some flowers for North to throw, quick! Clooney might not have been present at Jolie and Pitt's wedding, but he sent his congratulations and I'm sure the Jolie-Pitts will be glad to be present at his. Naturally, Pax could bake another cake in honor of Clooney and Alamuddin while Zahara and Vivienne could design a whole flower arrangement to be placed on each of the tables. Clooney likely already has his own flower girls in place, but Zahara and Vivienne have a clear eye for design. Clooney and Alamuddin's wedding is the Jolie-Pitt children's chance to turn their wedding planning from chance into career, is all I'm saying.